Abstract : The control of gaze and balance strongly depend on the processing of visual cues. The aim of this study is to assess the effects of the dynamic 2D and 3D visual inputs on the oculomotor and balance reactive control. Thirteen subjects were immersed in a virtual environment using 10 different 2D/3D visual flow conditions. 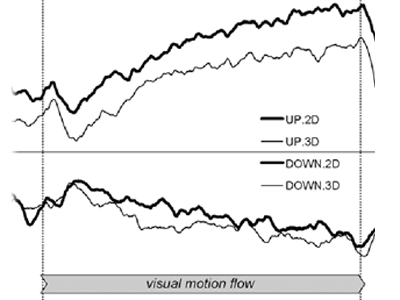 Analysis of eye movement and postural adjustments shows that 2D and 3D flows induce specific measurable behavioral responses.